Stegt flæsk IPA [stɛkt flɛsk] is a dish from Denmark consisting of fried pork belly and generally served with potatoes and a white sauce with chopped parsley (persillesovs). The dish is sometimes translated as 'pork strips' or 'crisp fried pork slices'. The pork belly or "breast" cut of a pig is used for stegt flæsk and the strips are cut about a 1/4 inch thick. Stegt flæsk is the national dish of Denmark and one of the country's most popular foodstuffs and has been described as "a dish of pork fat, and only pork fat, in parsley sauce. Mmmm." 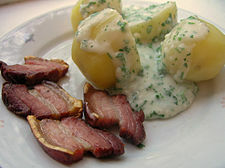 An "alternative guide to Denmark" from the British broadcaster BBC described stegt flæsk med persillesovs as fried slices of pork with fat served with parsley sauce and boiled potatoes. Stegt means 'fried' and flæsk means 'strips of pork belly'. It is lightly salted but not smoked. Stegt flæsk is included in The Art of Danish Cooking by Nika Standen Hazelton and Scandinavian Cooking by Elizabeth Craig where the dish is translated as "bacon with parsley sauce" Flæsk is also translated as 'bacon' in older language guides. The main difference between bacon and flæsk, is that flæsk will never be sold smoked, and often not salted either. By contrast, anything marketed as 'bacon' in Denmark, invariably will be both smoked and salted. The dish is especially popular at certain times of the year. Stegt flæsk can also be served with apple compote. Pork is the most popular meat in Denmark and bacon and cuts of pork is used in many dishes in the traditional Danish cuisine. Flæskesteg is roast pork with cracklings, usually served with rødkål red cabbage, gravy and boiled potatoes. Flæskeæggekage consists of a large pan of scrambled eggs with stegt flæsk, chives, tomatoes and rugbrød ryebread on the side. Leverpostej is a liver pate of pork liver, served both hot and cold in a variety of ways. Stegt medister is a thick, metre-long, spiced, minced pork sausage with lard and chopped onion, pan fried and served in a variety of ways. The BBC noted that whilst Danish food is not limited to just pork meat and pastries, "it would be fair to say they feature heavily in the diets of Denmark's citizens". An instructional video for cooking stegt flæsk on a ceramic grill was featured on Japanese KamadoTV. Jimi and René, a musical duo from Denmark, recorded a song on their Volume Four To Som Os album called "stegt flæsk med persillesovs". Tobias Trier, a Danish singer-songwriter, has also sung about the dish. KiMs, a leading Danish potato chips producer even made a stegt flæsk flavoured potato chip (now discontinued). ^ Dennis Drejer Trier-legacy is assured November 21, 2006 B.T. This page was last edited on 6 February 2019, at 14:12 (UTC).